When it comes to supporting a political candidate, many of us fail this critical thinking test. Some of us look for a candidate who supports a single issue that we care about or we find one who we think is the lesser of two evils. Historically, Americans have tended to vote optimistically – for candidates who represent hope and forward thinking like Ronald Reagan or Barack Obama, two of the most popular presidents of the last half-century. Voters in the American electorate say they like to see positive change and cling to those core American ideas like “freedom and justice for all,” or “the American Dream,” or “We hold these truths to be self-evident: that all men are created equal.” These are inclusive, aspirational ideals. Given that, Donald Trump is a candidate that mystifies many political observers because he is not inclusive or aspirational or optimistic; even his campaign slogan, “Make American Great Again” has dark undertones to it as people ask themselves the valid question: When was America “great”? What are we trying to go back to? (See this clip from The Daily Show for some hilarious satire on this question.) Candidate Trump seems comfortable alienating entire demographics of American voters. He relentlessly uses pejorative language to take shots at people who disagree with him or that he feels have been “mean” to him. He even denigrated the parents of a fallen American hero because they challenged him on his statements about Muslims. (The Khan family are proud American Muslims, immigrants whose son, an Army Captain, bravely died in service to this nation.) Part of his appeal, supporters say, is that he’s not a politician – he just says what he thinks when he thinks it – no filter. In a recent study from the Pew Research Center, support for an experienced candidate is stronger among Democrats and Independents than Republicans. He’s not experienced, he clearly lacks foreign policy knowledge, he does not understand the global economy, and he has dangerous warlord-like ideas about how to strike at ISIS (go after their families – their wives and children…wait – that was Macbeth, right?). This lack of experience, a perceived strength among Republicans, is not winning over the general electorate. And yet, despite some losses in the polls this week, there is a solid block of about 30% of the country who are determined to vote for Trump no matter what, even as prominent Republicans, longtime members of the party he represents in this election, are denouncing his candidacy and in some cases, even vowing to vote Democratic in November. Recently, elected officials such as Rep. Keith Ellison have asked the question that Mitt Romney and others have been asking for quite some time: what will it take for you to re-think your support of Donald Trump? Or is Trump right that he could shoot a man on 5th Avenue and not lose any votes? It ceases to be a Republican or Democrat question – it’s a moral question about what temperament and moral character we require in a president. In an article titled “Why Facts Don’t Matter to Trump’s Supporters,” Washington Post reporter David Ignatius points out the unsettling dynamic that, even when confronted with the worst of Trump, those who want to vote for him will not be swayed. They are not thinking critically about the choice. They know that Trump makes things up – like his claim that he watched thousands of Muslims celebrating the fall of the Twin Towers or that he saw a video of cash being delivered to Iran or an attack ad against his rival that contains a blatant lie – and even when confronted with the evidence of these wild, false claims, Trump supporters are not moved. Ignatius says, “the reason is that people tend to accept arguments that confirm their views and discount facts that challenge what they believe” – something known in psychology as “confirmation bias.” We believe what we want to believe. For those who don’t actively attempt to think critically, the way we think about things stems from our past beliefs – and facts only make it worse, make us dig in our heels even in the face of logic and reason. So what do we do? Well, as the saying goes, the first step is to admit there is a problem. I truly believe that voters want to make a good, conscientious choice at the ballot box. Confirmation bias is an unconscious activity. We are not aware that we are making bad judgments – until we are. But there also has to be a willingness to fix the problem. Accepting alternative views is hard – even on a small scale, it is hard for us to do. Most of us don’t like to admit we are wrong, that our thinking is flawed, or that someone else might have a better idea. Our egos and emotions prevent us from thinking clearly. But if we can put that aside, then perhaps we could begin to address the problem. And it is important to address the problem. The stakes are very high in this election. It is not unreasonable to say that by voting for a party and its candidate, you are endorsing the statements, ideas, and values of that candidate. You are declaring that you support them, expressing allegiance to them. And that says as much about you as it does the candidate or the party. The term of this commitment is potentially 4 years. I am not going to say that you should vote for one candidate over the other. You are not wrong to note that I seriously question the virtue of voting for Donald Trump, but by default, that does not mean that I think you should vote for Hillary Clinton. I think you should critically think about it. There are actually 4 parties and 4 candidates to choose from this election year (Democratic, Green, Libertarian, Republican). A critical thinker must consider every bit of it: the candidate, the party, and the platform. And then you have to make that decision, a deeply personal and important decision. The etymology of the word vote reveals that it stems from the word vow – a vow is a wish, a promise, one of the most sacred things we do. A vote is one of the most sincere acts we perform in life – or at least it should be. What I will say is that it does matter when and how and why you accept the arguments of a candidate and that you come to that acceptance with eyes fully open, understanding what led to that decision and how you may rationally justify it. No candidate is perfect, of course, but it is imperative to think critically – to come to a decision out of an exercise of reason to arrive at a place of value. Choose wisely. Today’s Republican party has created what you might call the abominable candidate, Donald Trump. In the tradition of Mary Shelley’s novel, Frankenstein, this primary frontrunner is a conglomerate of the worst possible parts of a person – racism, xenophobia, willful ignorance, entitlement, and bravado all wrapped up in one very ugly bully. As horrible as Trump is, he is the fitting harvest of all the acrid seeds sown by the most cynical and opportunistic people in the GOP in the last 50 years or so. Trump was sown by Pat Buchanan, Richard Nixon, Lee Atwater, and Ronald Reagan in their not-so-subtle race baiting that was so genteelly nicknamed the “Southern Strategy.” This strategy helped gradually convert the south to a Republican stronghold, primarily by appealing to deeply held prejudices among voters there through the use of coded language. If you think that strategy is dead, then ask yourself why Trump had such a hard time rejecting the support of David Duke and the Ku Klux Klan in the days leading up to Super Tuesday when several southern states were about to vote. Trump was sown by the Tea Party whose incendiary rhetoric has led to moments like the one where Congressman Joe Wilson, with a stunning lack of decorum, yelled “Liar!” at the President during his State of the Union address. From the Republicans in Congress, President Obama has faced blatant racism throughout his tenure. They questioned his legitimacy because of his foreign-sounding name and the fact that he was born in Hawaii. Yet somehow the party faithful can pretend not to know (or care) that one of the Republicans running now to succeed Obama, Ted Cruz, was actually not born in America, but in Canada. Where are those “birthers” now? The behavior of these GOP leaders emboldens the members of the base. Lack of courtesy, lack of respect, lack of decency abounds. The loudest mouth wins. Enter Trump. Trump was sown by the years and years of lip service the GOP gave to the concerns of religious voters. In his article “Jesus is not a Republican” from The Chronicle of Higher Education (June 2006), Randall Balmer makes the case that Republican politicians have repeatedly disavowed fundamental teachings of Jesus such as helping the poor, the use of torture, and the value of life all while courting religious voters. The religious political machine has focused more on punishing those who are down on their luck, ridiculing and humiliating them, calling them “moochers” and freeloaders. The machine has stood by while wars are prosecuted for false reasons and stood behind an administration that believes waterboarding is an ethical interrogation strategy. Trump has called for a return to the use of torture, even as he has said, “beyond waterboarding,” which is horrible to imagine. That’s not a position consistent with valuing life, and Trump has backpedaled on that position somewhat, but he has also said that we should target the families of our enemies – their wives and children. That’s something straight out of Macbeth, not the New Testament. We can’t pretend that these are Judaeo Christian values – they just aren’t. But this is the man who would lead the Republican party. The chickens are coming home to roost. The poor of the country, especially those in the south, are tired of Republican politicians taking their money and their votes and failing to deliver on any of their promises. The religious right are sick and tired of seeing their social issues used as a political football. Every four years, like Charlie Brown, they run out onto the pitch where Lucy waits, only to end up flat on their backs. Good Grief! Maybe not this year. You can’t blame voters for feeling that enough is enough and looking for an alternative, an outsider, a non-politician. So where does this leave moderate Republican voters? There are many of them who are people of good will who believe in things like small government at the federal level and a greater role for local governments and who have specific ideas about fiscal policy that don’t include destroying the middle class. There are many moderate Republican voters who do not hate Mexicans and Muslims and who do believe in the American Dream that so many immigrants come here to find. But this is not their Republican Party – for some time it has been slipping away. For years they have turned a blind eye while the party grew more and more extreme. If Mitt Romney’s desperate speech doesn’t tell the truth of it, then I don’t know what else does. It’s all hitting the fan now. Fox News viewers can hardly stomach it anymore. The former nominee basically begged voters to go out and vote for anyone but Trump, betting on, hoping for a brokered convention where the delegates can rally together and choose someone more palatable. In doing so, the party will basically slap the face of their own voters, saying, in effect, thanks for voting – that’s cute, but we’ve got this from here. As I wrote a few months ago, this is a crossroads for the GOP as we know it. Will they be defined by their new standard-bearer, Trump? Or will they have the courage to watch the thing they gave their lives to, broken, and find a way to build it new? In a surreal moment at the end of the Republican debate in Detroit, after spending 2 hours slamming Trump and declaring him unfit and unqualified to be president, we watched as these same men, Cruz, Rubio, and Kasich, all pledged to rally behind and support the eventual Republican nominee, even if that is Trump. If that is true, they have no one to blame but themselves. I can’t remember the last time I got excited about watching a Republican primary debate. Oh wait, it was…never. But this week’s Fox News debate was must-see TV for political junkies and, it seems, for the casual observer as well. Donald Trump has injected some hysteria into this soul-sucking process. He offers no specifics for how he will “Make America Great Again” (as his campaign slogan promises). When asked about the economy, the business mogul who has declared bankruptcy several times answers, “I’m really rich.” When asked how he will fix immigration, he says he will build a wall along the Mexican border with a “beautiful door” for legal immigrants, and I don’t know, spider monkeys to chase away the illegal ones? When asked about jobs, he says he will drag all the jobs back from China – but some of those workers make Trump’s own products. He is a traffic accident, and we can’t look away. Trump certainly strikes a nerve. For two-thirds of the country, he is an ogre. He’s rude, supercilious, uninformed, and just, well, un-presidential. In Thursday’s debate, he roundly dismissed one of the moderators, Megyn Kelly, and suggested via some “angry tweets” after the debate that her tough questioning of him might be related to her menstrual cycle. Yikes. He claims to love the military, but he said that Senator John McCain, a Navy veteran who was shot down over Hanoi during the Vietnam War and held captive at the infamous “Hanoi Hilton” for over two years is not a hero. 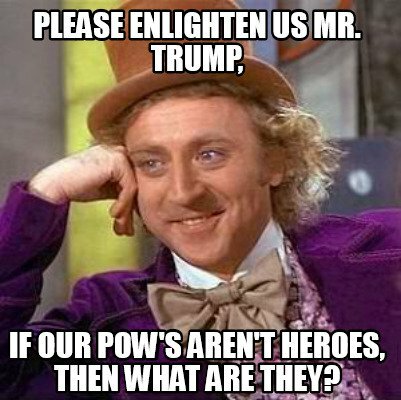 Trump says McCain is not a hero because he let himself get caught and Trump thinks heroes don’t let themselves get captured. Military friendly? Yeah, I don’t know about that. During the debate itself and throughout his campaign, Trump has been hostile to the other candidates, calling them “Losers” and mocking them. Trump most famously claimed that all Mexican immigrants are murderers, drug dealers, and rapists. For a party that has had trouble convincing the country that it is a party of inclusion, Trump is a nightmare. And yet, Trump is leading the polls for his party’s nomination. Just let that marinate for a second. For the nomination of one of the country’s two major political parties, Donald Trump is the leading candidate. Nate Silver, the brilliant New York Times columnist and political prognosticator, believes that Trump will eventually flame out. But in the meantime, it’s worth asking why his flame is burning this brightly. One of the reasons, I think, is something Trump himself mentioned in the debate: political correctness. Trump is unapologetically not PC, and the Republican base loves him for it. Trump represents the ethos of the “angry white man” – the lower middle-class, limited information voter that believes others are to blame for their own struggles and romanticizes a past when America was greater than it is now. Trump is the mouthpiece for this, and it’s playing pretty well. Unfortunately, Trump is drowning out more moderate voices in the crowded candidate field. It was not an electric moment, but Ohio Governor John Kasich had a very good moment answering a question about gay rights in which he sounded authentic, compassionate, and logical. But no one is talking about Kasich, a dark horse and late entry into this race who nevertheless managed to make the cut for the 10-candidate main event debate. Another Republican candidate who did not make the prime time debate, Senator Lindsey Graham, delivered a solid performance in the so-called “Happy Hour Debate” that occurred before. In particular, when talking about Social Security, Graham was empathetic and rational, acknowledging the need to get out of the entrenchment of party ideology to move toward a solution to save the critical entitlement program. Candidates like these who display authenticity as well as compassion and good will, are what the Republican party really needs. Maybe not these guys exactly, but a version of them. This is a critical moment for the GOP. As a liberal-minded progressive voter who has voted for the Democratic nominee in 5 of 6 elections since I became eligible to vote, there is a part of me that wants Trump to win the nomination because, first and foremost, he won’t win the general election. No independent voter will choose Trump no matter who he’s running against. But I also think that, if nothing else, his candidacy might finally force a sea change within the Republican party. I know some Republicans who are socially progressive but fiscally conservative. There is a middle ground where outliers of both major parties sit. In truth, I think this is where much of the Republican party is. But the base of the party controls the primary cycle, so it’s hard to gain the nomination without pandering to the social issues and anti-everything rhetoric that are dominated by the party’s extremists. If the GOP isn’t careful, they will get Trumped! in this election – and the party as we know it now may never recover. Posted on August 8, 2015 September 9, 2015 Categories Culture, Marginalia, PoliticsTags 2016 election, culture, Donald Trump, politics, Republican partyLeave a comment on Trumped!